Yesterday I called a friend of mine who just had a baby three months ago. From what was intended to be a quick phone call turned into an hour, since my friend decided to share her worries and anxiety. She is currently in the first weeks of being a SAHM (Stay at home mom) and still grappling with her new life, with some difficulties. Having been employed in a prominent Indonesian bank for more than six years, her new life at home is too surreal for her. A job, a workplace, or a career, has provided her with a sense of identity and sense of purpose. When she was no longer attached to a job, she became lost (and she didn’t realize that). Indeed, being part of a corporation gives a person an easy sense of identity, because the “sense of purpose” was injected by the corporate structure and the job description. There’s no need for a journey for self-discovery. In a corporation, who you are, where you stand, what you do, what’s your rank, it’s all instantly imposed on oneself. In fact, it’s generally what people do. People join a group, or a club, or an affiliation (religious, political, hobby, whatever), because it gives affirmation of one’s identity, necessary for one’s “survival”. And now, my friend is a stay-at-home mom. But she’s not happy (yet). And she’s confused, why she’s easily irritated by her children, why she’s easily snapped up to her husband. Basically being a SAHM turned out not to be a bed of roses at all. And when I highlighted that it may be because of her losing her sense of self-worth, which has been provided by the corporation for a very long time, it was like a revelation for her. I am not claiming to be an expert in this field, not at all. Nevertheless I decided to share my own perspective and experience of the situation to my friend. I decided to take a break from career when my first baby was about four months old. At that time, it was more practical that way. We were living in Singapore, and having a nanny or a maid was totally outside our budget, so we decided to take a leap and I quit my job. I can totally relate to my friend’s feeling during the early days of being a SAHM. Embarrassingly, it took me about one year to reconcile and make peace with the fact that I am, indeed, a SAHM first and foremost. Although people may think that it is not, quitting job and becoming SAHM is actually a big change. Especially if one have been employed or have a more-or-less settled way of life. It is not an easy process. So, it is totally normal to go through a soul-searching process. I personally find some tips and tools that I wished I had known before, to make my own transition easier. And I hope it can be useful for you who want to take the same leap of faith. Just because you don’t commute to office every day, you’re excused to waking up late, not taking a shower, and dozed off. You can do that on the weekends, but we’re talking about weekdays here. It is good, and I found it necessary, to maintain a basic structure in daily life, because other things (such as projects) can be fit into the puzzle when the structure is there. It’s easier to do by just keeping a daily rhythm similar to when I was working in the office. Wake up the same hour as when you need to get ready to go to office. Determine that, say, from 9-5, will be a “productive” hour which you can spend by setting small tasks and goals for yourself, or doing projects, even though you’re now doing it from home instead of office. Don’t stay in the sleeping gown (I stayed in my sleeping gown all day for the first few months of being SAHM, and really, it has kept me low in the mood). Dress up neatly, nothing fancy, just neat enough so that you can easily go in and out the house, or receive guests without having to excuse yourself. When done in the morning, it sets out the mood for the day. With a jumbled emotion during the adaptation process, my friend was confused and stressed out, and she doesn’t know why. I found writing has brought three-fold benefits for me: One, it is therapeutic because it helped me untangle my feelings and thoughts. Two, it helped me separate real issues from emotion-laden freakiness. Separating issues from feelings is really important in order to maintain smooth communication, especially with the spouse. If you like, you can let your spouse read the journal too. Third, the writing process itself gives a feeling of “productiveness”, that helps to return the feeling of self-worth and speed up the process of self-discovery. If anything, you can always password protect your Microsoft word document. For me, the following journal structure helps. First, I write everything about my feelings, everything. Just pour it out. Then, I read it again, and proceed to write the second part, on why I feel the way I’m feeling. Third step, I read it again, and start to write conclusion, outlining the real issues and the emotional impact. The last step, I can figure out ways to address the real issues, but only keeping the emotional aspects on the sidelines. Make a name card with your name, email address, cellphone, and whatever you define yourself to be. You can write “Professional Domestic Manager” or even “Mother”. Or you can put your projects or plans, like “Freelance E-Commerce Entrepreneur”, “Child-Rearing Researcher”, or “Early Childhood Education Specialist”, or “Breastfeeding Counsellor”, whatever. When one works in a corporation, the name card is a projection of him/her who represents the corporation in the public sphere. As a SAHM, you are representing yourself. The name card is a tool that depicts and projects your aimed identity or goals. It also gives the SAHM an “equalizing” factor when socializing in a diverse group of people. When talking to your husband’s colleague, for example, instead of weakly and diminutively present yourself with “I’m only a housewife” presentation, you can confidently say, “I AM a professional housewife”, reach out your hands forward, shake hands firmly, and hand out the name card. Yes, I am a housewife and mother first and foremost, but I’m also doing it professionally (although I’m not paid a salary). And please, it is not an easy job to do. Every day I do my homework of doing research on child-rearing, household management, ensure everything is in order, ensure my kids have balanced nutrition, source for good pre-school, sit in parent teacher association, etc etc. Hopefully the tips above can help the transition into SAHMhood easier for you all, who has been so used of being an employer. And hopefully you can be a happy, professional SAHM! i always thought that the best jobs for moms would be as part-timers or entrepreneurs. Great post! I've been a stay-at- home-wife since getting laid off last year. It has been an adjustment. Everything got turned around. Then I realized the advantages. I cook more and enjoy life more. I love your advice. My job has been to prepare and pass my architectural licensing exams. It gives me structure. I think I am helped by knowing that my own mother was a SHAM and always emphasized the value. It's something I've always admired more so than a super career girl! I'll always love architecture and the design world but I do not have to be defined by sitting behind a desk on some one elses schedule. Ah- freedom! Sounds good for me, even I'm not a woman neither a Mom :) But I look for your articles and this one has interest me. thank you for sharing. I'm not yet in the stage where you are now as I'm still a corporate slave. And you are absolutely correct about the identity thingy with the corporate life.. I feel really suffocated with something in the air which I can't describe really well, but lately I kind of get it: being in a corporation, you'll need to transform yourself fully into it.. your are merely your job, your self-worth is how much it is valued in your company. And I have trouble with my identity-less self... After almost 10 years of working, i just managed to define what my problem really has been! I long for the day I can roam free and --identity wise-- although i know it will be much of a challenge, but knowing that some women and men have gone through the path and ended up liking it after some struggle, it helps a lot. It must be very liberating to be able to connect to who you really are than just merely to what you've done in a corporate. Thanks for sharing and for the tips! hi Rani! how are you? I can relate my personal experience with your writing. I have been staying at home for about 10 months since resigning from a telco company. Though it was surprising many people, I was firm with the decision. For me being around with kids is my ultimate objective since I am a mother. And you are correct about the tips. Staying at home doesn't mean giving excuses of waking late, staying with sleeping gown or messy hair. I always do my routine just like I used to do before resignation. 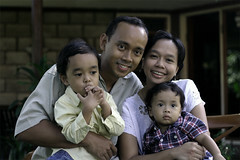 I run a business from home which is very flexible and by which I can earn living while still being closer with my son. I think we should not put our identity as SAHM as something inferior to the working moms. So, get dressed and be productive!